High above Lake Ringedalsvatnet a piece of rock extends out over the waters far below like the tongue of some giant beast – which has earned it the name ‘Troll’s Tongue’ or Trolltunga in Norwegian. It was formed around 10,000 years ago during the last ice age and is Precambrian rock. 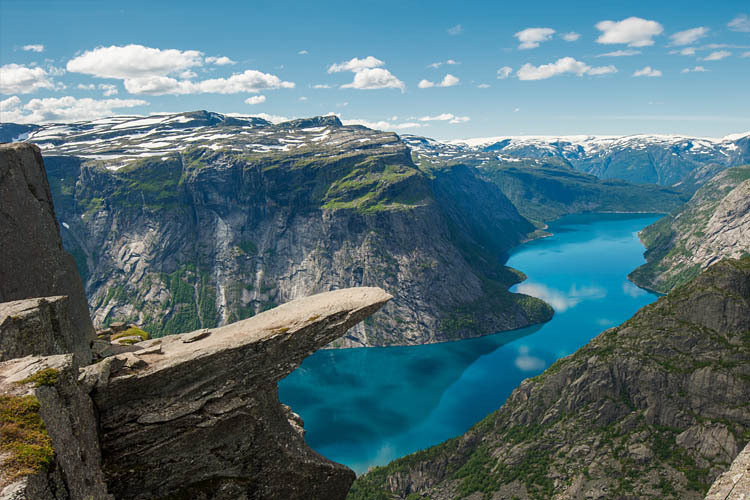 The drop from Trolltunga to the lake below is approximately 700metres (2,300 ft). Located in the municipality of Odda, in Hordaland county,Trolltunga has become a popular if dangerous destination for hikers and it takes a fit person around eight to ten hours to complete the 22km route. During the peak season as many as 500 people make the trek every day which can result in the trail becoming muddy and slippery. There are no safety railings at the Trolltunga and extreme caution is advised. Every year search and rescue parties are kept busy locating lost or exhausted hikers. For those that make it to the top without incident it is considered to be one of the most spectacular views in the world.